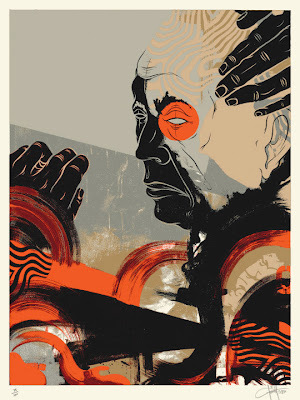 To tie in with his new solo show "Sure, Why Not" at BLK/MRKT Gallery in L.A., Dave Kinsey has released a new screenprint. This beautiful new print titled "Terminal Solipsism is an impressive 9 colour screenprint on 100% cotton rag. Signed/numbered/stamped and an edition of 225. Get your self one now over here. If like us your not in LA, you can check some of the work from the above mentioned solo show on Kinsey's website here and Juxtapoz has also posted some pictures from the private view on their website here.